I have had a pretty blessed life, full of love, but even I admit that grandchildren are special. Some of you know that I uprooted my life and redirected my path in ‘retirement’ when I learned I was going to be a grandmother. And, I do not regret my choices one bit. I know that I have laughed more in the past few years that I would have known possible and thanked the powers that be that I am able to spend as much time as I do with my now two grandchildren. However, it is now 2017 and Judy Kate has grown a bit. In anticipation of a move to a twin size bed, her Mom suggested that I might consider a new quilt for Judy Kate. 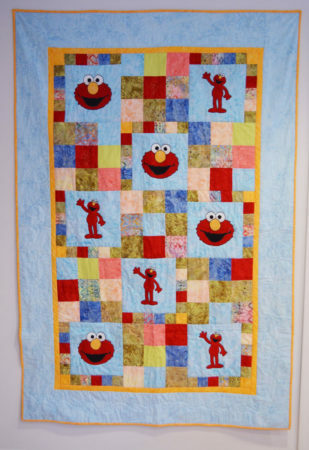 Her little sister, Miriam, would certainly be delighted to inherit the Elmo quilt. Of course, I agreed. However, several years older, with a downsized Bernina, and having spent much of time in the intervening years quilting up smaller projects, a twin sized quilt was a bit of a stretch. But, can you ever say ‘no’ to a request from granddaughter for a quilt? Of course, not. So, over the summer Judy Kate and I discussed colors and themes. I really could not get excited about spending hours on a Batman theme (her current hero) so we went with her love of oceans, Hawaii, and whales. I came up with a design, got approval, and decided that a block approach would perhaps work best with quilting on my smaller machine. I researched quilting each block separately but that approach didn’t lend itself to my design. I considered letting a long arm quilter take over for me, but I wanted my granddaughter to be able to look back at the quilt and know her grandmother made the entire quilt. 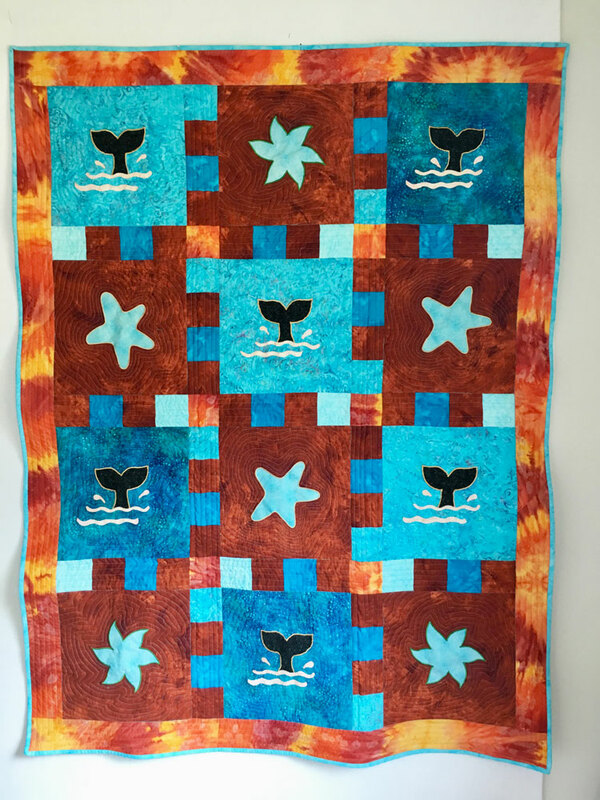 So, in July I did all the pre-work and then spent the past two weeks using any free time I had to quilt what I will call “Whale Tail”. I quickly appreciated that I needed to let go of any expectations of ‘perfect quilting’. To say my stitches are not uniform would be an understatement. And, there are zigs and zags as I moved the quilt while I ‘fmq’ed. Fortunately, in my mind, the design called for a relaxed, child like pattern of quilting so only an expert quilter would find fault with my endeavors. My granddaughter definitely will not! What making “Whale Tail” has provided me with was an opportunity to share my love of fiber and stitching with my granddaughter, to contemplate how precious she is to me, and to be grateful for the life I have been blessed with! what a joy it was to read this post…..the relationship with the little ones and the devotion you have for them and also getting them started young with stitch!! That’s a great plan. This is a wonderful quilt and t will be treasured for sure. The quilt is charming Judy as is your commentary on grandchildren, mine have been the greatest joy! And when they are grown it gets even more exciting – just spent a few days in Manhattan with the 20 year old and it was wonderful. What a fun quilt and extra special because your granddaughter has her own unique stamp on it. My husband and I are fortunate that three of our children live very close to us and so we see our grandchildren often. They are a true blessing and keep me busy quilting, sewing and knitting for them. Wonderful colours, like fire and water. Makes me think of a firey sunset over a calm ocean. These quilts you make are amazing, Judy. I’m sure the things you make for your grandchildren will be treasured and become heirlooms. Whale Tail is beautiful, Judy. And your story brings back memories of my favorite aunt (Mimi) — sitting beside her at her old pedal-operated Singer, Mimi teaching, and me watching and learning and feeling loved. Thank you for that memory, my friend. Much love there. See you soon! You must know that you are someone special – not everyone is lucky enough to have a daughter-in-lw like you! Oh what a delightful quilt Whale Tale is! I enjoy reading about the delight you have taken in your grandchildren and I hope I am blessed with some too. Simply delightful! I know it will be a treasure for Judy Kate, and I love the humour in the title as well as the bright, colourful blocks. Delightful is the word for Whale Tale from me, too! That will be a family treasure. Thanks for sharing your journey and process with us! Beautiful, I can hear the song of the whale when I look at this. Really enjoyed reading your post too. It reinforces the important things in life.